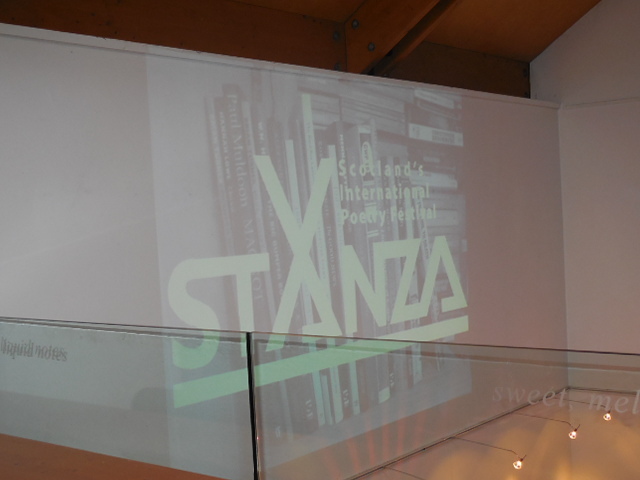 I went to StAnza this year for the first time, invited up with the poetry and art exhibition, ‘The Lightfoot Letters’, in which I had collaborated with the wonderful Maria Walker. I went with no idea what to expect, except from what poet friends had told me about it: that it was friendly and celebratory. I’d have loved to have gone to the full day workshops with Jacob Polley and Vickie Feaver, which were leading up to it, but with other commitments and the need to mount the exhibition on our first day, it wasn’t possible. 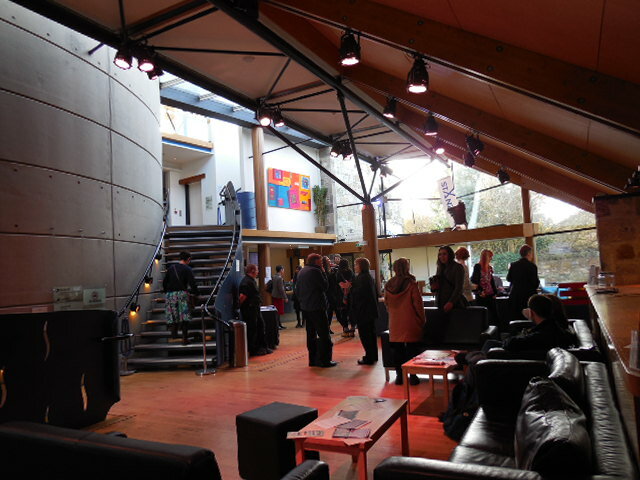 So my first event was the launch in the Byre. It was great to immediately find the redoubtable Sally Evans, who was with Colin Will and someone I didn’t know. She showed me where to hang my coat up and where the free wine was (she knows me so well). The launch was excellent: Eleanor Livingstone made a welcome speech which did its job perfectly, and we listened to some short performances. The soprano Angharad Rowlands, who sang exquisitely in Welsh, and the gentle-voiced Louis de Bernieres read us some of his poems. I hadn’t known poems were his first love. Afterwards I persuaded my husband to come to see Rime with me, which turned out to be incredbible, as young people performed heart-stopping acrobatics to portray the tale of the Ancient Mariner in a new way. I particularly liked the folk singing within this show. I think it is touring now so catch it if you can. On Thursday 6th March, I attended a workshop with Brian Turner, American war poet, which I had booked in advance, as workshops are limited places and do tend to be sold out quickly. Brian was excellent, sharing the techniques used to write about war in a range of ways, and inviting us to try them out on a topic of our choice, after looking at poems which deployed them well. I really wish I’d been able to attend his reading in the evening, when he was sharing a stage with David Constantine (whose work I have liked for a very long time), but we were both exhausted and took a night off. The next day I went to the Poetry Scotland showcase, with four terrific readers, two of which I had heard before and wanted more, and two new discoveries: Giuseppe Bartoli and Nikki Magennis. 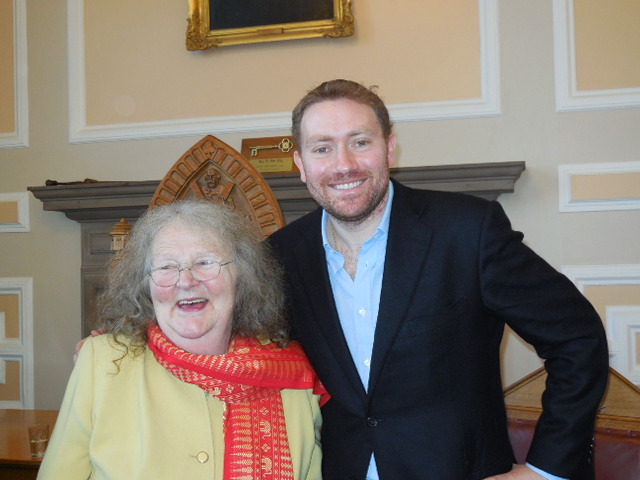 It was great to bump into Red Squirrel poet and friend, Elizabeth Rimmer, and indeed StAnza is a glorious meeting place of poets, greetings and hellos filled every venue. Katrina Naomi and Tim Ridley’s artist talk was interesting – I loved the way Tim had become more serious in his responses to his partner’s work, while Katrina’s poems became more playful, and I particularly liked her crocodile poem alongside Tim’s superbly sinister drawing. I read a poem at The Quiet Open Mic at Zest juicing bar, which was very ably run by Jim Carruth. The standard was high but it managed to be a relaxed event. It was great later on to hear John Burnside but such a pity I missed Tishani Doshi, who was reportedly brilliant. I’d hoped to read at the late night open mic but once again I was all out of stamina. Saturday was a very full on day, and each day that passed I was more and more at home. The day began with a great workshop with John Greening (whom I had wanted to meet for ages as we have both written books for Greenwich Exchange). Again I got the start of several potentially good poems. I do think it’s important to go away from a poetry festival with some new work started. After soup in The Byre (where yummy food was served all week), I had a great time at the Poets Market, bumping into lots of friends including Pat Borthwick, Sheila Wakefield, Colin Will, and finally getting to meet Gerry Cambridge. Had a great natter with him about Norman MacCaig, swapping memories, and I bought a back copy of The Dark Horse with Gerry’s article on MacCaig, the old charmer. I bought lots of books – couldn’t help myself – to add to the three I got from JG Innes on the first day. There were several great events on in the afternoon, but I had to go and deliver my artist talk at the exhibition, which was great fun. I have a couple of videos from that which I will post at a later date. I’d decided not to try to get into the Carol Ann Duffy reading because I had it had sold out, but there was live streaming in the Byre, had I but realised. I have heard our poet laureate read many times over the years, so I thought I’d let others have the chance. I did go to the Slam though, later on, but was so tired I only stayed for the first round. Great to see Sally owning the stage and the other performers were terrific too – the judges had a very tough time. I’d never been to a slam before. Sunday was in many ways my best day because I was so relaxed after the artist talk and had met lots more friends by then, and felt I’d been going to StAnza for years. Paul Muldoon’s masterclass was brilliant. It was interesting to discuss the poems chosen, and he asked probing questions of the audience, but the best part was at the start when he spoke about poetry, saying many things which I deeply feel and agree with. There was no soup left in The Byre, so we had lunch at the Chinese before I dashed off to read a poem about Scotland in the Poetry Tour of Scotland event in the studio theatre. This was hosted by Colin Will (who gave me a warm introduction, and Andy Jackson (of Split Screen fame), and featured an interactive map of Scotland and some really excellent poems by a range of Scotland’s best. I missed Stephen Raw’s events but had several looks at his inspiring exhibition and a chat with him about his process. 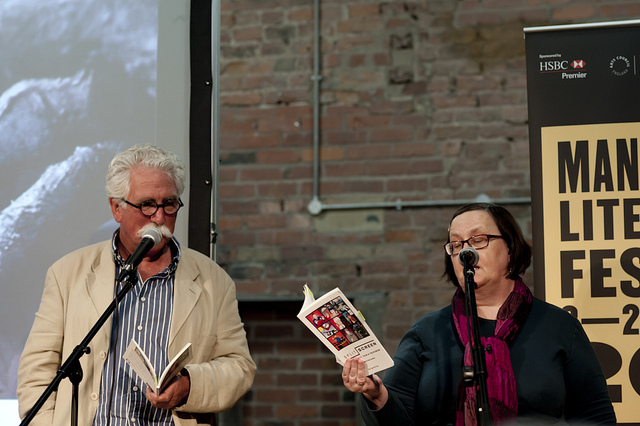 Later on Sunday night I went to support friend David Costello who was reading a poem at the launch of Poetry in Protest. I sat next to Paul Muldoon and had a private word with him about his excellent masterclass. Menna Elfyn was the first reader on the main stage for the closing night and she was nothing short of magical. I could have listened to her all night, in both Welsh and English, and her voice is so melodious, her words so right. Paul Muldoon took things slowly and I honestly felt like I was sitting at his kitchen table in Ireland, just soaking up his words and gorgeous accent. He even read some early stuff which I had been familar with for years – ‘Why Brownlee Left’ with one of the best line breaks ever, and ‘Anseo’, before moving on to newer poems. His chat between was both assured and modest. The festival closing party after that was just great, chatting, dancing (I didn’t but liked watching), getting a private look at some of Jean Johnstone’s artist books, meeting even more poets, and the sorrow that it was all over. It’s just one of the best poetry experiences I ever had. It was buzzing. Poetry was on everyone’s lips.